It was a year ago but it seems like yesterday. I sat in my office at NC State University on a cold February morning, pressing the telephone handset against my ear as I dialed the number. On the other end of the line in Southern California was one of our alumni, an engineering graduate I had met four years earlier when he participated in a poetry project documenting the Arab Spring in Egypt and Tunisia. 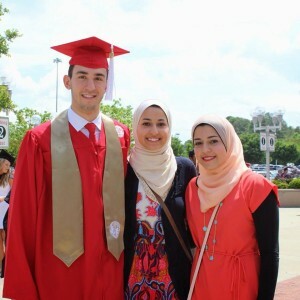 From left, Deah Barakat, his wife Yusor Abu-Salha and Yusor’s sister Razan Abu-Salha at NC State. A young Muslim who studied engineering, wrote poetry and wasn’t afraid to risk arrest or worse in the pursuit of truth in a dangerous world, Mohammad Moussa confirmed my faith in the millennial generation. Now, as he came on the line, it occurred to me that maybe he hadn’t heard yet. Maybe his friends and family had given him the gift of one last night of peaceful sleep. But of course he knew that his friends were dead, murdered by a neighbor as they prepared dinner in their Chapel Hill apartment the previous evening. News so tragic, so painful, spreads with merciless efficiency. I asked him to tell me about his friends and former classmates, to distill the essence of their lives in a few words that we could share on the university’s website. But he was shattered. The pain was too raw, too powerful. And so we cried. “Why,” he said finally, his gentle voice strangled by grief. Then he thought of Deah’s wife, Yusor. His voice trailed off and we were quiet again for a few minutes. We have to learn to pick up the shattered pieces of our lives and fashion them into something strong and enduring, he said in the performance. We have to craft the shards of loss and grief into a mosaic of life and love. It seems like yesterday but we’ve come so far in the past year, I thought as I sat in the darkness, listening to Mohammad’s words of hope and healing. As a university, as a community, we are moving through the grief, finding ways to channel our anger and loss into service and action. Then the tears stung my eyes again and I realized that we still have so far to go. So sad. Thanks for showing how the worst can bring out the best, & offering positive ways to address awfulness. Beautifully written. David, you are such a gifted writer.